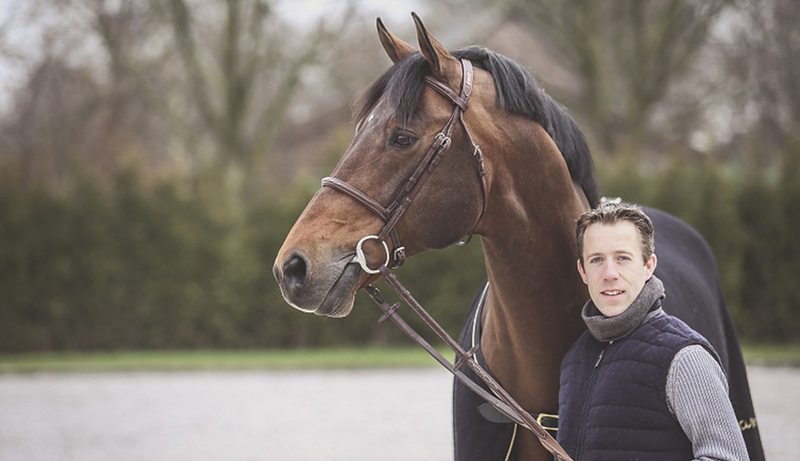 A few weeks ago we were lucky enough to get an intimate behind the scenes look into top show jumping stallion Verdi’s life at home, where he lives with Olympic Silver Medallist and 2017 LGCT Champion Runner Up, Maikel van der Vleuten, in The Netherlands. But theirs is a partnership that is already one for the history books, with the duo competing together on the international circuit for over 12 years. This week we take a look at the other half of the phenomenal pairing, and sit down with Maikel over a coffee at home to get to know the softly spoken Dutchman a little deeper, what motivates him and why his stallion is so extraordinarily special. Last year 12 out of the 15 LGCT events had the top 7 riders in the world or higher taking part - it’s really top sport. You were so close last year to taking the Championship title, you came runner up, why is it such a special series? There are so many good combinations at the moment, and you never know before the Grand Prix starts who is going to win. That makes it very exciting! The Longines Global Champions Tour and League is the “name" in show jumping and the riders want to bring their best horses to those shows. With every show having 7, 8 or 9 out of the top ten there is always great sport. I had a very good start in the Championship last year, I went down [the rankings] a little in the middle and then I had some good results at the end. Harrie [Smolders] was the other way round and it worked out better for him! Looking ahead, what would it mean to take the title? It means to me that you are the best rider in the world, consistently. You are able to bring good results in every kind of arena, every situation, and you have the right horses. And you are, at that moment, the person who has made the best plan for their horses. It’s a great measure of who is consistently on form. It’s an important title for riders to win. Even second place gave me a good feeling, but to win the title is something special. It’s a title to look up to. Is that the end game for this year then? Take the Champion of Champions accolade? That’s the plan! And to win at least one Grand Prix so I can compete in the Longines Global Champions Super Grand Prix in Prague at the GC Playoffs - something that I think will be very exciting. Ha it’s true! I must be thankful to my father - he gave me Verdi when he could have taken him all the way to the top himself. I did quite well in the juniors and young riders, and he saw the potential in our partnership - it’s nice that he gave Verdi to me, he was completely my project and we grew up together, learning a lot together! So it really must start with thanks to my father. Do you think Verdi has an even more special place for you because of that - there’s more meaning and depth behind it. It’s your Dad saying “I believe you both can do this…"
Perhaps! Of course I look up to [my father]. In the end I could not think too much like that or the pressure would be too great. I have other horses but for sure Verdi is very special to me for many reasons. What is the greatest strength you feel you have as an athlete, personally? That I believe in the horse I am sitting on and that I can stay strong in my own feelings. That’s not always easy! Everyone can see a good horse, but everyone also has their own opinion about a good horse. With Verdi for example, when I started with him he was four years old and I knew I was sitting on a good horse. I kept the belief in my own way of developing him. It took maybe two or three years to get the right balance and the right control with him, but I always felt something good when I was jumping him. In the end it worked out very well. It doesn’t work out well with every horse, but I think it’s important that you're not swayed by other people’s opinions. Do you think the horse can feel if you believe in them? Yes, absolutely. With Verdi for example, I’m never aware of the time when I’m riding him. It goes so fast. Or if my plan was to ride on the canter tracks and it’s raining, I’ll still always go. It’s a pleasure to ride him. Not many things could stop me riding him, and that’s a feeling I’ve always had with him. Where does your own confidence come from? I think it's something that builds as you go. Like with my father, he will always be there for me but he always let me go my own way. If I’d like to get something out of his mind, I’ll have to ask him. That’s good as you always have to think about yourself and what you’re doing, but it’s also not always easy as you can overthink things! You have to take your confidence out of the results, and if it goes once or twice not so well then you have to watch the video, analyse what went wrong and work on it. How do you not get consumed by the challenges? How do you see it positively? You learn not to. As a young kid if I was second or third I would be really disappointed, but now you know sometimes you make mistakes - every rider does! And you can either be sick of it or after five minutes you can think about why it happened and then let it go. And make yourself stronger every time. If you name a good sportsman like Usain Bolt - he was the best, and you know if he's feeling good in himself he's probably going to win. But it’s not necessarily the same in our sport. It depends on how the horse is feeling, the circumstance, and then you. For sure there is a rider sometimes who is in a winning mood, like Harrie Smolders is at the moment, but he also keeps winning because he’s very realistic and knows that is can quickly drop down again. So it’s about knowing your horse, and knowing yourself, which is why the partnership is just so important.